The entire administration area has been redesigned from scratch. It has a new look and many new customization options. For example, the page width, colors and font face and size are just some of the things that can be customized. Custom fields allow your customers to enter their own information when checking out in your storefront. A custom field can collect any type of information you like, and fields can be created specifically to collect customer or product information. General info fields can also be added to the checkout process. of formats, to capture the data you seek. In addition to the new field formats, there is no longer a limit to the number of fields you can create; create an unlimited number of fields for capturing customer, product and transaction information. Custom fields can be given a Display Order, providing control over the order in which they are displayed in your storefront. Text fields can be given a character limit. All fields can be given an optional default value. This value will be the default value of text fields, or the default selection of radio buttons, checkboxes and menus. Fields can be set to encrypt the data they collect, so it is stored in your store's database in a secure, non-human-readable format. Text fields can be set to "strict" format, so they will only accept letters, numbers and underscores. Any other characters entered into the field will be rejected. A new engine for installing software updates has been developed. Software updates will now be installed automatically in the background. Users will no longer encounter the "installing a software update" screen when logging in to their store's administration area after an update has been released. 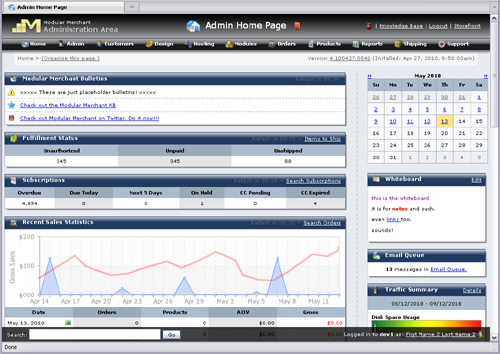 The search and other interface elements present on each administration page have been redesigned. Inconsistencies between the interface on various pages have been fixed whenever possible. The way you search for something on one page will match the way you search for something on every other page. All references to "Scheduled Orders", "Memberships" and "Subscriptions" have been standardized as "Subscriptions". For example, the "Subscription & Membership Products" module is now named the "Subscription Products" module. Every administration page includes a "super search" that will search customers, orders, products, etc., and display all relevant results in one location. All references to "Manufacturers" have been changed to "Vendors".